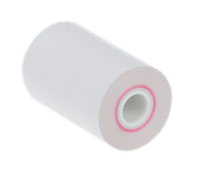 New NCR 9078-0567 Thermal Paper Solid Core Compatible Rolls. Also compatible with the following part numbers- ZT2050/ 140-050/ 1207/ 3295/ 19350DT. Fixs Axalto Magic X1000, Blue Bamboo Model P25/ H50, Celerex CX 1000, Citizen CBM262/ CBM270, EBW Auto Stik 950, EMCO/Wheaton Tank Monitor II, Extech S1500T/ S2500THS, First Data FD400 Terminal, Hypercom I.C.E.4000/ 4000CE/ 5000/ 5500/ 6500, Hypercom T7P-T, LinkPack 3000/ 9000/ 9100, MagIC 6000, Match CONSULT-II, Nissan Monitor, Nurit 2080/ 2085/ 2090/ 3000/ 3010/ 3020/ 5000/ 504/ 505/ 8000/ 8320, Omni 3200/3210/ 3300/ 3730/ 3740/ 3750/ J.C. 1160 Series/ OM20, Oneil 2t/ 2te, Printek Mt2, Royal Alpha 583CX/ 600SC/ 9155SC, Samsung ER5200/ ER5240/ STP-103/ STP-131, Schlumberger MagIC 6000/ MPT/ICC SII, Sharp 01PU/ 01PU/ XE-A201, Standard Register S40, Talento Dassault, Veeder Root TLS350, Verifone Omni 3200/ 3210/ 3300/i 3350/3740/ 3750/350/ 355/ (Verifone part #CRM0027), Vx510/ Vx520/ Vx570/ Vx610/ Vx810 Duet/ Vx820 Duet And many more printers.